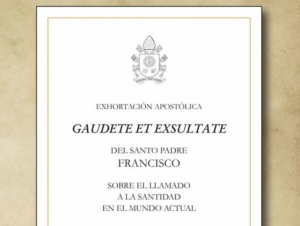 The Pope’s Apostolic Exhortation, “Gaudete et Exsultate” (Rejoice and be glad), and subtitled “On the call to holiness in the contemporary world” was published today (Monday 9th April). The very readable document has five chapters which explore the call to holiness, the enemies of holiness, what it is to be holy – through living out the beatitudes, the signs of holiness in today’s world and spiritual combat. Pope Francis reminds the church of the example of the saints and how their lives are an imitation of Christ. He also states that this imitation is not limited to the canonised or beatified but to “God’s holy and faithful people, for “it has pleased God to make men and women holy and to save them, not as individuals without any bond between them, but rather as a people who might acknowledge him in truth and serve him in holiness”. Stressing the importance of women, he writes, “I would stress too that the “genius of woman” is seen in feminine styles of holiness, which are an essential means of reflecting God’s holiness in this world. Indeed, in times when women tended to be most ignored or overlooked, the Holy Spirit raised up saints whose attractiveness produced new spiritual vigour and important reforms in the Church. We can mention Saint Hildegard of Bingen, Saint Bridget, Saint Catherine of Siena, Saint Teresa of Avila and Saint Thérèse of Lisieux. But I think too of all those unknown or forgotten women who, each in her own way, sustained and transformed families and communities by the power of their witness”. In chapter 3, Pope Francis answers the question: “What must one do to be a good Christian?, the answer is clear. We have to do, each in our own way, what Jesus told us in the Sermon on the Mount. In the Beatitudes, we find a portrait of the Master, which we are called to reflect in our daily lives”. Calling for patience, perseverance and meekness, as signs of holiness in today’s world, the Holy Father also states the need for joy and a sense of humour. “Not a joy that is gained from today’s individualistic and consumerist culture”, he writes, “but a joy lived in communion, which shares and is shared, since “there is more happiness in giving than in receiving” (Acts 20:35) and “God loves a cheerful giver” (2 Cor 9:7). He concludes by writing, “It is my hope that these pages will prove helpful by enabling the whole Church to devote herself anew to promoting the desire for holiness. Let us ask the Holy Spirit to pour out upon us a fervent longing to be saints for God’s greater glory, and let us encourage one another in this effort. In this way, we will share a happiness that the world will not be able to take from us”.